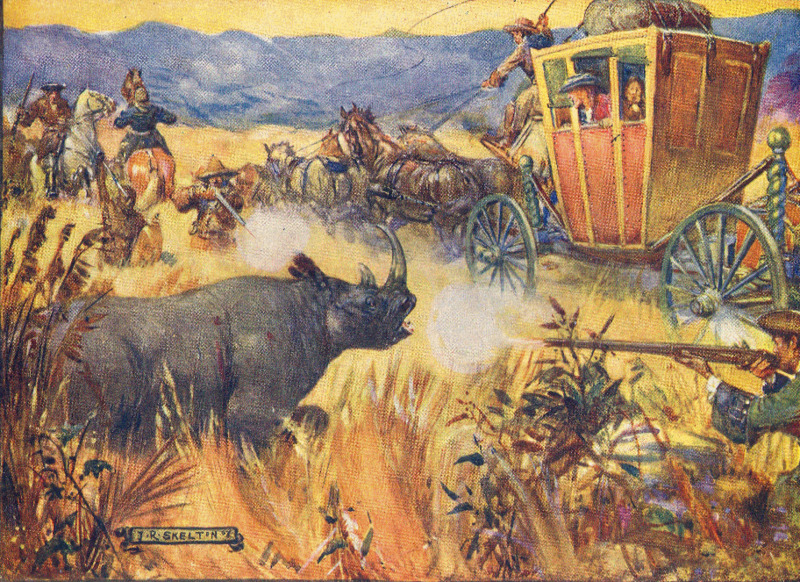 The name Banghoek was coined after a chance rounding of a corner and coming face to face with a Rhino, and a similar encounter which nearly ended Simon van der Stel’s rule in September 1685. In this regard, the following extract, which is thought occurred in or near the Reserve, is quoted from “The Historical Mammal Incidence in the Cape Province”, written by C J Skead. The Rhinoceros, by its sudden ill-tempered attack and its apparent short-sightedness, must have been a black rhinoceros. It ran away at speed followed by a hail of musket balls which it survived. So we know that there were plenty of Rhino around – just 155km from Cape Town! Kapteinskloof was recorded as a hunting concession granted to Simon van der Stel’s brother Adriaan in the late 1700’s when the entire area teemed with game. Other books written about the West Coast around that time also make reference to the prolific game and Rhino in particular. What a pity is has all disappeared. Let’s make sure that what is left of our flora and fauna remains for future generations. Described by some as the Wild West of early South African history, the rugged Piketberg Mountains and Sandveld – in general - have not yet been excessively commercialised. Nigel Penn (historian and UCT Professor) in his book “Rogues, Rebels and Runaways” recounts many a colourful tale that played off in the area – stories of how frontiersmen jostled for control of cattle, water and pasturage. Driving to Banghoek and the area beyond, it is still possible to visualise where and how these sagas played out centuries ago. The road still in use today was then the major pass through the “Piquetberg” Mountains on the way to Elands Bay and Aurora and was shown on the early maps of the Cape hinterland. Wagons and coaches were the modes of transportation. When land was allocated, the farm that became known as “Banghoek Estate” was recorded as “Boschkloof” and under that name it was first granted as a “loan place” “for only one year” to Johannes Lubbe on 15th March 1781. On June 15th 1821 it was granted as a holding to Johannes Henricus Fischer from whom it was transferred in 1832 to Jan Nicolaas Smit. The existing farmhouse was probably erected between 1821 and 1849 and over the years it has seen a number of additions and alterations, but apparently much of the original building remains. There is a painting by J C Poortermans in the Africana Museum (Museum Africa) entitled “The Estate Banghoek, situated in the Piquet mountains, Proprietor I Smith Esq. 1849” which shows the farmhouse, wagon with oxen on the road and cultivated fields where the old orange groves are today. In the 1800’s Banghoek served as an ox-wagon stopover with a Blacksmith, water mill and schoolhouse with over 60 pupils. Jan Smit died on 15th December 1859 and the farm was subsequently bought by his son-in-law, Dirk Jacobus Kotze, who had married Madge Maria Smit. On his death it passed to his two daughters who married into the Burger family who farm the valley to this day. Banghoek is a sectional title development comprising a maximum of 40 units plus the original four farm buildings. It falls under the ambit of the Sectional Titles Act No 95 of 1986 as amended. The Reserve is governed by a body corporate which comprises all the owners who elect from their ranks a Board of Trustees to act on their behalf. The full registered name of the development is “Banghoek Private Game Reserve” registration No 5597/91. The Body Corporate was registered on 16th May 1991. The entire Reserve comprises some 1000 hectares. After allocation of the exclusive use areas, including the farm section, about 750 hectares remain for the enjoyment (and co-ownership) of all owners. The Trustees acting on behalf of the Body Corporate have the responsibility to look after and maintain this area. The major part of the Reserve forms part of the Cape Fynbos Biome. The Reserve is home to a number of animals, mainly nocturnal. Many birds are to be found, particularly around the stream areas (and the majestic Black Eagle has made Banghoek their home). Banghoek is one of the few remaining relatively pristine areas of Fynbos left in the West Coast area and is largely Mountain Fynbos. It boasts a number of rare and endangered species and includes an area of Renosterveld within its borders. Owners are privileged to own, and be custodians of part of this unique floral kingdom, and it is incumbent on all to preserve it for future generations.